Romantic Village Beer, occasionally known as Utsunomiya Craft Beer, is a craft beer brewery based in Utsunomiya City, Tochigi. Romantic Village Beer is located on Romantic Village, a large resort area that encompasses various different areas for people to play and also an onsite brewery too. 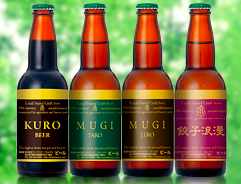 The brewery itself uses locally sourced two-row malt from the local Tochigi area and also tries to ferment their beers from anywhere between 45 to 65 days on site before bottling. Romantic Village Mugi Taro – a 6% pilsner brewed from locally sourced malt from Utsunomiya along with Czech hops. Romantic Village Muji Jiro – a 6% pilsner that uses yeast cultivated from the outside of barley. Romantic Village Gyoza Roman – a 6.5% märzen style beer that was brewed in conjunction with the Utsunomiya Gyoza Association. Romantic Village Kinugawa Onsen Beer – a 7.5% dortmunder that uses onsen water from the Kinugawa area before it has entered public use. Romantic Village Kuro Beer – a 5% schwarzbier that is available from May to October. Romantic Village IPA – a 7% IPA that contains 2 – 3 times the regular amount of hops used in the pilsners. Romantic Village Fuyunokiseki (Winter Miracle) – a 6.5% dortmunder / helles style beer that is available from November to February. Romantic Village Weizenbock – a 7% German style weizenbock with chocolate flavours. Limited edition with serial numbers from mid-January. Romantic Village Imperial Stout – a 9% imperial stout that uses brown sugar sourced from Okinawa. Available from mid-January.